Hi everyone and welcome to the MFT release night Shop & Hop! :) All the stamp sets that have been "peeked" over the 5 past days are available NOW right HERE! There are SO many adorable sets to choose from! :) Make sure you check out the NEW MFT Rewards while you are shopping! Earn the January Triple Scoop set when you purchase 3, full-sized sets ($15.95 or more) OR 6 mini sets (which retail for $9 each) OR the appropriate mix of the 2 scenarios. LOL Make sense? :) The Triple Scoop set is an UNRELEASED stamp set which cannot be purchased until the February release. First and FREE... you can't beat that! Earn the Cherry on Top reward when you purchase 7 full-sized sets ($15.95 or more) OR 14 mini sets (which retail for $9 each) OR the appropriate mix of the 2 scenarios. When you earn this reward you can choose ANY stamp set on the set for FREE! Just add it in the comments section of your order. Ready to SWING (pun intended) into the projects for today's post? The image was stamped in Memento Tuxedo Black and colored with Copic markers (except for the umbrella, which was paper-pieced). I went over the rain puddle and rain drops with Stickles. Here is a shot of the inside of the card. I LOVE finishing the inside of the card. It helps pull it all together AND provides the recipient with even more "cute" to appreciate. You've reached the end of the hop! Thanks for participating! Be sure to leave a comment on each blog for your chance to win BLOG CANDY from ONE of the designers (it'll be a secret until she posts the winner). Pure Innocence stamps are my new faves! LOVE your cards! Thanks for sharing with us. Awesome cards Jody!! So, so precious! So sweet, Jody!!! I am lovin' that sky paper!! These are super cute Jody! Perfection! Love the look. That sums up the last 5 days!!! GREAT Projects Jody!!! 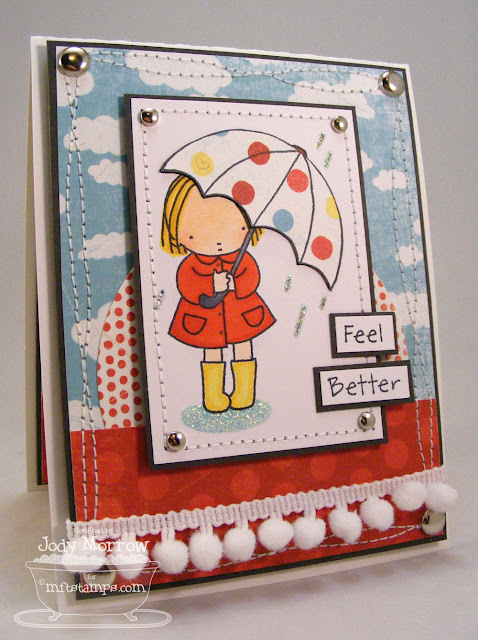 Love the bright colors whether she's swinging or standin in a puddle, both cards are "happy" cards!!!! Thank you SO much for all that you have done the last 5 days!!! It was a TOTAL thrill a minute to see each project sneeked!!!! oh, gosh, so many things i loved, the 'cloud', the bow, then the stitching. just terrific. Gorgeous! Your work is always flawless! The bright colors are fantastic, and I love the stitching detail! Love all thdetails your put into your cards, they are fantastic! You are uber talented! Your cards are so stinking cute. I just love them. more polka dots. you can never go wrong with them. This is Beautiful! Love the adorable image, the paper, and the way you finished off the inside. What great detail with the stitching. Last but not at all Least. What great cards. I really love that Weeee. Thanks for the hop now on my way to shop! All your projects have been so amazing this week Jody and this is no exception! Thanks for the inspiration! You create such beautiful scenes with your cards. I love reading through these creations. Thank you for sharing. AHHHH I love the whee card! hook line and sinker, now I have to try that! Great work! Love the cards and colors, so bright and fresh. God bless! oh, Jody! I try to be like you and stamp efficiently...doesn't always happen, lol! 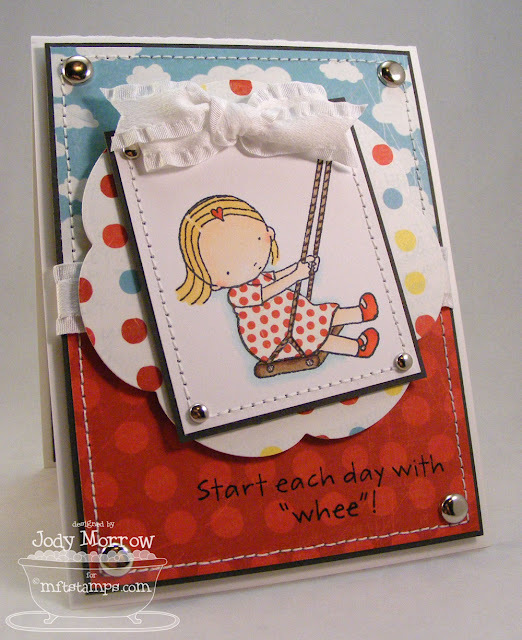 LOVE your cards-you make that Wheee set even better than it is! I must get my hands on that paper-thanks to you! and once again, thanks for all your emails over the last two months. I've had a blast hanging out with the MFT family! You girls do it right! These cards are so stinkin' cute! I love the paper piecing! Can't wait 'til my sets arrive! Wow - love these Jody!! Love all the layering and stitching and of course your colouring is perfect!! Absolutely amazing as usual! What a fun hop! Thanks for sharing all your talent! Great projects!!! With each hop, I am drolling more into the keyboard!! Thanks for the inspiration!! So cute!! I love the insides of your cards, they're totally adorable! Oh my gosh, you just keep wowing us w/ your superb talent!!!! I love these cards! They are simply fantastic!!! So adorable! I love this line of stamps! Love your cards!! As always, FABULOUS!! Great DP!!! so cute! love your cards! Gorgeous cards Jody! I love your clean, crisp style! Super cute cards!! I love the DP you chose! Both of these are so adorbale... 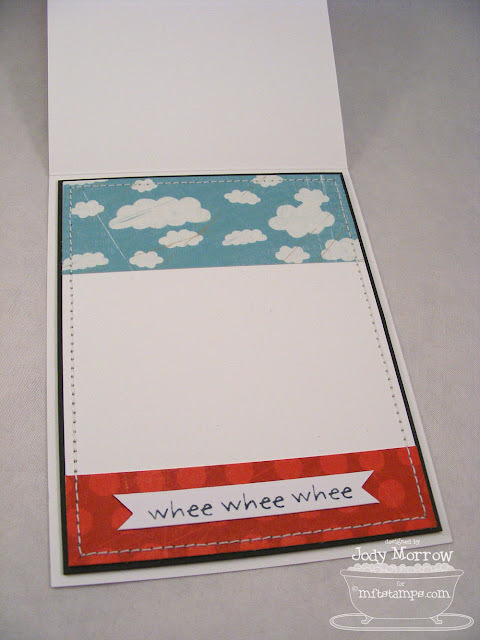 I love the cloud paper too! Lovely cards! I love your cards Jody! Incredible! Don't even know where to begin these are SO so cute. LOVe this new line but the DP u used makes it even cuter! Adorable!!! These are BOTH just as cute as can be, Jody! I really like the wavy stitching on the second card! Lovely card, great sentiment and sure to cheer someone up. All of your projects with this group of stamps have been gorgeous!!! Looking forward to the slider tutorial and a package of new MFT goodies! I'm totally lovin' these cards, Jody! Fantastic layouts and awesome colouring! The cloud DP is totally working for me on these cards! It's just perfect. I love the inner detail too. Oh my heck Jody, words can not do these cards justice. They are freakin' AWESOME. HOW in the world do you get your stitching so straight & right on the money??? I need help! oh very nice cards on all the hops...the new sets are awesome...I do not yet own any of your stamps, but trust me..I started a WANT list for the hubster...gotta pay off christmas first lol..luv all the detail...and I am following these blogs now too..tytyty! Jody your cards are FANTASTIC!! I love your stamping efficiency because I can't get enough of those papers!! So sweet and I love the finished inside!! I loved it and I love all of the inspiring ideas! Thanks. I also really loved the colors you used and the stamps...oh my goodness the stamps are amazing. I just LOVE both of these cards! These little girls are just amazing and I have loved watching you work with them even before they were a part on MFT! Fabulous creations! More stunning cards as usual Jody. Love all the stitching you add to your cards, so classy. love both cards. great color combinations. and like that you do the inside of the card too...i really should do that.... thanks for sharing such great projects.